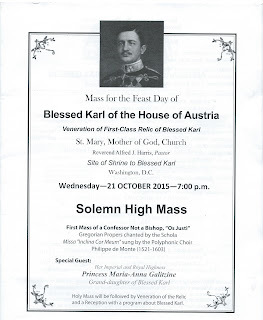 Last night (Wednesday), I was invited to the Mass for the Feast Day of Blessed Karl of the House of Austria, which included a veneration of First-Class Relic of Blessed Karl. The nearly 2-hour mass in Latin took place at the St Mary, Mother of God Church in Washington, D.C. A reception at Market to Market cafe took place following the service. 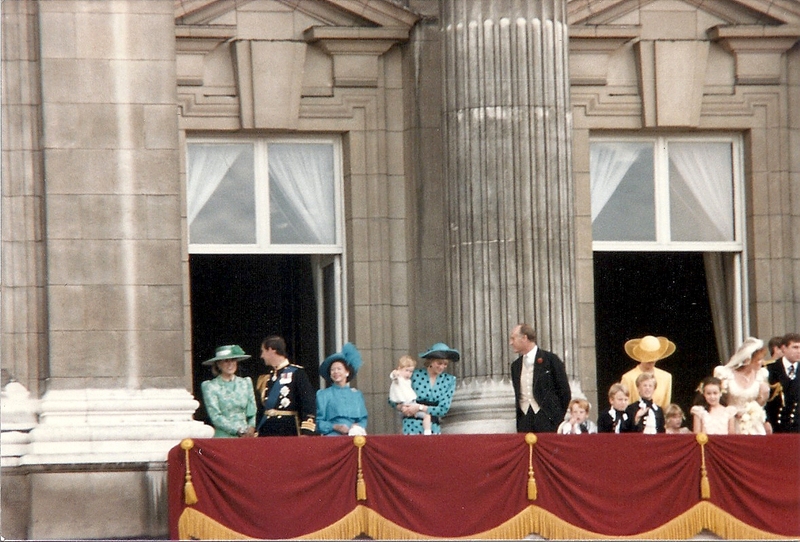 The guest of honor was HI & RH Princess Maria Anna Galitzine, Archduchess of Austria, eldest child of the late Archduke Rudolf of Austria, sixth child of the late Emperor Karl of Austria and his wife, Princess Zita of Bourbon-Parma. The service included representatives from the Johanniter Order (Protestant), the Society of King Charles the Martyr, the Sacred Military Constantinian Order of St. George, Order of the Saint Maurice and Saint Lazarus, and a several others. Thank you to Julius D. Jackson, Knight of the Holy Sepulchre for inviting me to this service. Father Richard Mullins gave the Sermon (Homily), which was in English. He spoke about the late Emperor's life and his faith. Archduke Karl married Princess Zita of Bourbon-Parma on October 21, 1913, After the ceremony, he said to his wife : "we must help each other to go to heaven. Karl and Zita were devout Catholics, devoted to their faith, creating a strong marriage and raising eight children. Father Mullins also spoke about the need to support traditional family and marriage, and the "rights of the unborn." These themes were also highlighted during the speeches and testimonies at the reception. The service ended with members of the congregation coming to the altar to kiss the relic. 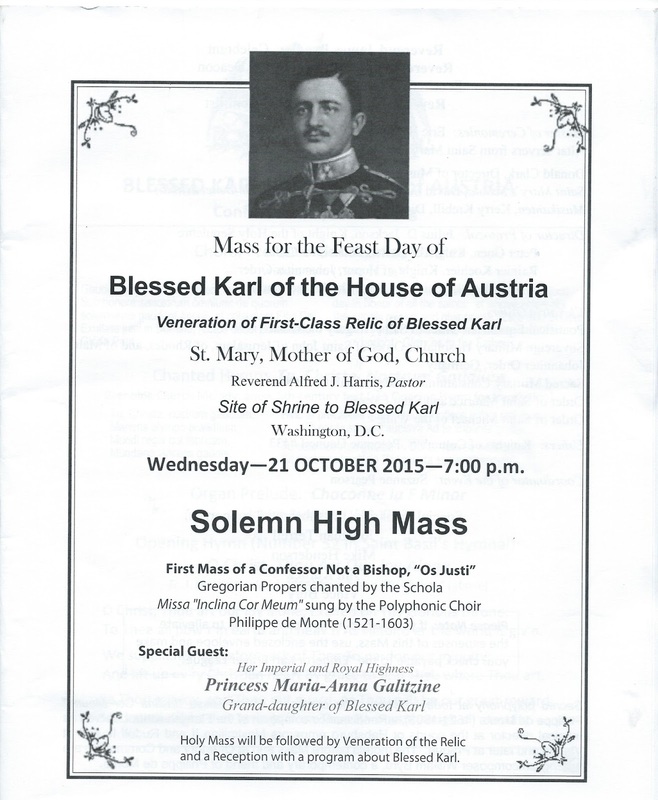 There were also prayers for the canonization of Emperor Karl, who was beatified by the Roman Catholic church in 2004, and is now known as Blessed Karl of Austria. Princess Maria Anna, who lives in Texas with her husband, Prince Peter Galitzine, gave a moving speech about her family, learning about her grandfather from her grandmother, Empress Zita, and how faith is important to her. She spoke from the heart, about her beliefs of traditional marriage and abortion. These websites provide more information on Emperor Karl and the movement toward canonization by the Roman Catholic church. A bit disappointed in my photos. I did not use a flash for some of the church photos. I did not bring my big flash, as this was a mass, and I wanted my camera to be discreet. I am the copyright holder, so if you want to use the photo, please ask. A complete set of the photos will be provided to the organizers of this event, for inviting me and allowing me to take photographs. Marlene, thank you for this beautiful entry. I enjoy your blog and was pleasantly surprised to read about Blessed Karl. I'm also an academic librarian, a Catholic convert and lay Dominican. Blessed Karl, pray for us. The Blessed Karl is buried in Madeira Island, where I was born. I know the Austrian Government is trying to bring his remains to Austria. Do you know if there is any update on this? I know that the Portuguese Government does not want to "disturb the one who will be saint" I visited his tomb many times when I was a child. It is just outside the church that they went and not far from the mansion where they lived.